In a world dominated by computers, cell phones, digital cameras, and flashy automobiles, the lowly toothbrush was selected in a survey as the most important household device in the United States. Good brushing is that important! The first mass-produced toothbrush was cobbled together by William Addis, who while incarcerated in an English jail in 1780 for causing a riot, used his time in prison to drill a hole in a small animal bone and fill the opening with bristles producing a simple toothbrush. The first patent for a toothbrush in the United States was issued in 1857, and by 1885 the toothbrush was produced just about everywhere in the country. But it wasn’t until WW II when brushing teeth became a part of the American soldier’s daily routine, a routine they brought home with them, that the toothbrush became a household item. 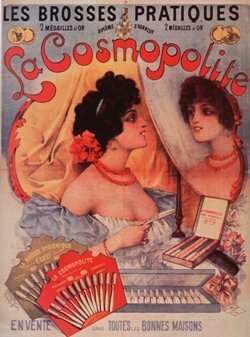 This French advertising poster promoting a line of toothbrushes called “La Cosmopolite” is a reproduction from a lithograph, around 1890, by the artist Louis Galice. Note the warm orange and peach colors and the woman holding a toothbrush and looking at herself in a mirror with boxes of toothbrushes nearby. The French advertising poster is one of 70,000 images that can be found on the images from the History of Medicine Division database. July 1, 2009 in Collections, Products.